There is a common refrain to set minimum quality standards for goods and services, often under the guise of helping the poor. These can appear as explicit quantity minimums, overly strict safety standards, and unnecessary bundling. The net result of these policies is a pricing out of the poorest and a reduction in consumer welfare. The proponents of these policies believe they'll improve the lives of the poorest by preventing companies from offering substandard products. This is based on a fundamental miscalculation that if the lowest-tier products are banned, all consumers will migrate to the minimum quality product. A large contingent cannot afford the minimum quality product and will instead be priced out of the market. They'll experience a loss of consumer surplus as they make do without the product or substitute it with a second choice product. Let's consider two examples as an illustration. There are periodic cries for the government to set seat pitch minimums on airlines. These crescendo when large legacy carriers propose introducing new low-tier products such as "Economy Minus" that eliminate a few inches of seat pitch. The new low-tier classes have similar seat pitch to existing budget airlines such as Spirit and Frontier. These low-tier products increase competition and provide a larger route network and more frequent flight options to those that would otherwise fly budget airlines. Banning budget flights by mandating minimum seat pitch keeps flights out of reach for more people. In lieu of flying some will choose to drive which takes more time and is less safe. Likely more people will die from car crashes than cattle class induced blood clots. There has been a secular trend towards debundling in the airline industry as legacy airlines slowly shed perks added before deregulation. This allows airlines to offer a lower introductory fares and move the price of additional services to those who use them. This receives pushback despite allowing airlines to offer cheaper fares and there have been calls to regulate the price of checked luggage. Seattle's attempt to kill microhousing is an example of explicit minimums. The city council has passed a series of regulations that effectively increased the minimum allowable size of apartments. These are touted as a way of keeping people out of inhumane living conditions. Instead they limit the number of housing units that can be built and increase the minimum cost, pricing people out of shelter. As a result they wind up on the street or in below-code housing camps without heating, running water, or sanitation. What is sold as an attempt to improve living conditions actually does the opposite. California has mandated that new homes come with solar panels. This is an unnecessary bundling as solar panels are not a required component of effective shelter. This policy drives up the minimum price of a California house and keeps more people from home ownership. Most energy efficiency initiatives have similar results of driving up the price of an entry level home. 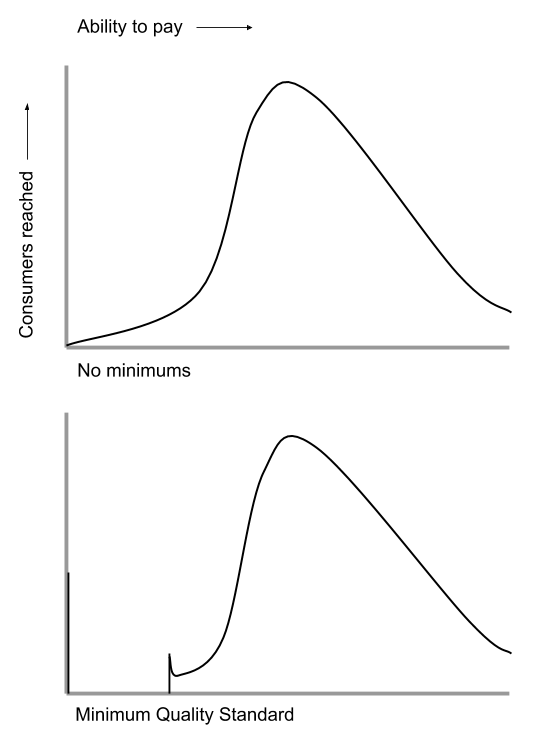 Minimum Quality Standards are pernicious policies that reduce consumer surplus and make those they are designed to help worse off. Rather than banning the lowest rung of products, we should strive for competition and letting consumers make the choice about which products are best for them.